Of all the professionals you'll meet in any pursuit you choose to participate in the Scottish ghillie is the most likely individual you'll form a life long relationship with. These men of Scotland's famous rivers are generally great souls with vast amounts of 'real life' experience relatability coupled with a deep routed love & fascination of salmon and their in-river habits. The relationship you have with any professional salmon beat ghillie will form a major part of your thought process as to where and how often you fish the Scottish salmon rivers such is their importance to the industry. There's way more to Scottish salmon fishing than catching a fish and what I'm about to explain are a few astute thoughts on what to expect and how to handle a professional Scottish salmon ghillie. A professional ghillie aside from his duties in maintaining the salmon beat and fishing hut fascilities he's in charge of is a 'true' ambassador for his venue. The Head Ghillie on any beat is the man who calls the daily shots and quickly assesses fishing guests and manages them into pool rotations that fit their fishing skills and requirements. Fairness and the personal safety of all fishing guests will always play a big part of his thought process. A Head Ghillie's mind will be whirring like and overheated computer when his guests are arriving at the fishing hut each morning to quickly figure out how best to play the salmon fishing approach to gain the maximum advantage from the daily fishing conditions and to ensure the guest's enjoyment so forget the first part of the day to get to really know your ghillie when you're on a beat for the first time. Wait until everything is under control and the fishing morning is well underway and the Head Ghillie has had a chance to dart round all his fishing guests before you start to strike up a more indepth conversation. Better still wait until lunchtime or during the afternoon when you'll find the ghillie to be much more relaxed and personal. Understanding what a professional ghillie is there to achieve each day and how his attention levels are contractually split between multiple paying guests will go a long way to ensuring a great ongoing relationship. Turning up late without a phone call or not understanding that the ghille will often have many other fishing guests to look after can put a strain on the initial introduction to any beat ghillie. 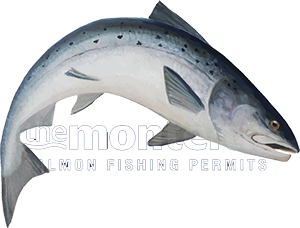 Once you really get to know the professional Scottish salmon fishing men of Scotland you'll unlock a true 'treasure trove' of salmon fishing information through watchful eye river observations you'll never read in books so be patient and pick your moment to take the relationship to the next level. Although many professional ghillies like the taste of malt whisky many are also wary of this kind of gratuity and would often much prefer a £20 note discreetly tucked into their hand upon departure. Can you imagine what would happen to anyone if guzzling whisky was a dailly ocurrance and believe me when I tell you this that most salmon fishing professionals in Scotland have been there at some point in their careers. A salmon fishing guest walks away to recover after their day on the river and a professional salmon beat ghillie starts all over again the following day so be careful & thoughtful with your hospitality and generosity.